Heart of Acadia! Mountain Views, Close to Ocean Drive & Bar Harbor. Property 7: Heart of Acadia! Mountain Views, Close to Ocean Drive & Bar Harbor. FALL SPECIAL-$210 PER NITE! FAMILY HOME JUST OUTSIDE BAR HARBOR-SLEEPS 9! Property 10: FALL SPECIAL-$210 PER NITE! FAMILY HOME JUST OUTSIDE BAR HARBOR-SLEEPS 9! Lovely Home Mountain View’s Heart of Acadia. Property 17: Lovely Home Mountain View’s Heart of Acadia. Property 24: Brum Chalet, beautiful cedar home abutting Acadia Natl Park. NEW LISTING! Home w/deck, great location in the heart of Acadia National Park! Property 25: NEW LISTING! Home w/deck, great location in the heart of Acadia National Park! The farmhouse was very nice! We enjoyed just about everything about it. The location was absolutely perfect. Close enough to walk to many parts of the park and close to the town of Bar Harbor. Without the cable for tv, we had fun many evenings playing games and cards. The little cabin was especially nice for our 25 year old son to have a little privacy. Also, there is now a set of pyramid bunks in it instead of just a single bed. We would definitely book this house again. Loved it! We loved our stay in this home. We wanted to stay outside Bar Harbor but close by. 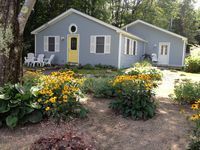 This cottage is only 4 miles from Bar Harbor in a quiet neighborhood in Otter Creek. There is a market on the corner when you turn to go to the cottage. They have lobster rolls, clam chowder, lobster dinners, and more. It&rsquo;s a short walk to Island Explorer bus stop. It&rsquo;s close to entrance to Acadia NP. The cottage itself is nicely furnished and clean. Very comfortable, especially the bed in the master bedroom. It is well stocked with everything you need. If we ever have the chance to return to this area we would want to stay here.